The one thing that can be said with absolute certainty about the historic first meeting between North Korea’s Kim Jong-un and South Korea’s Moon Jae-in is that it took place despite Donald Trump’s policies towards North Korea, not because of them. It was not sanctions or Trump’s threats that drove Kim to seek rapprochement with South Korea; it was the fact that the North’s nuclear weapons’ programme had advanced with a new deterrent put in place, the DPRK[i] could negotiate from a position of strength. Despite Trump’s own inflated claims and those of his international supporters, the only sense in which Trump can be held to have contributed to the current détente is that the population of South Korea became so horrified by his apparent push to war on the peninsula that Moon – elected anyway on a platform of rapprochement with the DPRK – felt strong enough to drive ahead with the opening to the North despite Trump’s belligerent stance. At no point has the US even particularly encouraged the rapidly unfolding peace process; it has been dragged behind developments on the peninsula, not driven them. At the opening ceremony for the PyeongChang Winter Olympics, US Vice President Pence both demonstratively remained seated for the joint North and South Korea teams entry into the stadium, and studiously avoided even acknowledging Kim’s sister who was sitting close by him as guest of honour from the DPRK. This behaviour from the US was met with near universal vilification. Outside a war-mongering coterie within the Beltway, across the globe this initial thawing of relations on the peninsula was greeted with delight and genuine emotion, not least because it alleviated real fears that the world was teetering on the brink of nuclear war. By the closing ceremony Trump had learned the lesson, and Ivanka, his representative stood for the Korean teams – though still avoided interaction with the DPRK delegation. From the Winter Olympics the momentum towards substantive talks snowballed, without any help from the US. Indeed, when in late February Moon Jae-in suggested that the US should lower its threshold for talks with the North – which was to demand a commitment from the DPRK for total denuclearisation with no preconditions – Trump’s response was to impose the largest package of sanctions to date on North Korea, despite it having carried out no new nuclear tests and already being engaged in a process heading to negotiations with the South. Meanwhile, Kim’s March visit to China was a clear indication that the DPRK was serious about seeking a thaw on the peninsula. He would not have made the effort to go to Beijing – or been invited in the first place – if he was not offering the Chinese something they seriously wanted to hear. China’s concerns on the Korean peninsula are twofold: to avoid an escalation in military tensions – not just because of the actual threat of war, but the cover this gives the US in undertaking a regional military build-up actually aimed at China; and also to avoid any devastating economic or political collapse in the DPRK that could allow a US-led reunification of the peninsula, giving it military access to the Chinese border. For nearly 70 years it has been the existence of the DPRK that has prevented US troops being stationed on the Yalu River overlooking China’s northeastern industrial heartland and only 1000km from Beijing. Thus Xi would have wanted to hear Kim’s proposed steps to reduce the nuclear tensions, but he almost certainly also received some commitments to engage with China to further ‘market socialist’ reforms in the DPRK, which China sees as crucial to deliver the kind of growth in living standards that can ensure stability in the North. Over the last five years Kim has already carried through significant steps in this direction, which have included infrastructure investment and ‘privatisation’ of some kinds of small business. This has underpinned a healthy rise in DPRK GDP growth rates – 3.9% in 2016, its highest growth rate for 17 years, and after 7 years when its growth has averaged little over zero. 2016 also registered 4.6% export growth, despite tightening of international sanctions. But this has stalled over the last 18 months with the impact of increased international sanctions and deteriorating relations with China inhibiting mutually beneficial economic relations. China’s drive for the further opening up of the DPRK economy to Chinese investment is not motivated by any potential, tiny, economic benefit to China, but by its political concern that any future reunification of the Korean peninsula should be the outcome of equal negotiations between North and South, explicitly limiting the US military presence, which requires a successful and dynamic DPRK. The Xi-Kim meeting in Beijing led directly into the historic Moon-Kim meeting on the North-South border, again without any role for the US – beyond Trump giving his endorsement to a process that was already proceeding. The Moon-Kim meeting was an evident success at every level. The meeting has increased the popularity of Moon Jae-in, currently polling at an astounding 75% in South Korea, and has amplified support for the peace process with the North. Prior to these recent developments support for Korean reunification in the South had been declining, particularly among younger South Koreans, with a recent survey showing that 71.2% of South Koreans in their 20’s opposed reunification. 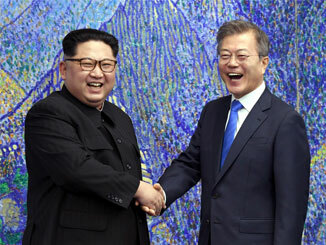 The meeting in April between Moon and Kim has reportedly had an impact on this already, not least because Kim himself made a favourable public impression; the evident rapport between him and Moon was reinforced by positive responses to his confident and relaxed manner of speaking – the first time most South Koreans had heard the North Korean leader speak in his own voice. The success of the meeting has left Trump little choice but to agree to start serious planning for his own meeting with Kim. Driven by his notorious amour-propre, Trump would no doubt like the accolade of being the first US president to meet with a leader of the DPRK. But there have been numerous voices of caution from hardliners in the administration who believe the US is being rushed into talks with the North without any guarantees as to what it is really prepared to offer on denuclearisation. And, from their own point of view, they are right. Kim has promised an end to tests and the destruction of North Korean test site(s), and he has pledged to discuss full denuclearisation. But he has not agreed to abandon any of the DPRK’s existing nuclear weapons or missiles, which Kim sees as a necessary deterrent to any Iraq, Libya or Syria type operation by the US against the North. This is a long way from the verifiable full denuclearisation that has been the US precondition for talks right up until the last couple of weeks. But when NBC journalist, Chuck Todd, pointed this out, it provoked Trump into a typically hyper twitter response to ‘sleepy eyes Chuck Todd of fake news NBC’ , where Trump claimed that North Korea had agreed to ‘Wow…denuclearisation’ when this was manifestly untrue. This is all further evidence that it is not the US, but careful tactics by Kim and the North, aided by the desire for a peaceful solution in the South, that is driving the process towards talks. The underlying problem for the US in this unfolding peace process is the threat that it poses to the US military presence in South Korea. South Korea’s strategic location has always placed it at the heart of US military policy in East Asia, both in relation to the USSR in the past, and currently primarily towards China. The US bases in South Korea are its only ones actually on the continent of Asia east of Islamabad; geographically they are the most proximate to China of all its bases, and its annual naval exercises with South Korea take place the closest to China’s shores. [ii] Only Japan is as militarily and strategically significant as South Korea. From 1950 until 1994 the US had complete day-to-day operational control – OpCon – over the South Korean army. This was ended for peacetime operations in 1994, but OpCon would still revert to the US in the case of war. The transfer of wartime command over its own army to South Korea has been serially postponed. Since the end of the Cold War in the early 1990s, opposition to the US’s military role and presence in South Korea has grown, sometimes erupting into major street demonstrations – most recently against the installation of the US’s anti-missile THAAD system. The US’s winning card in seeing off opposition to its military role in South Korea has always been the ‘threat’ from the DPRK; its image in the West as an irrational rogue state and exaggerating the threat from its primitive nuclear weapons programme have ensured both the South Korea’s compliance and Congressional support for the huge budgets required. Periodically the actions of the DPRK have indeed seemed to confirm allegations that it challenges regional security. But US inflexibility on the DPRK has been driven less by the actions of Pyongyang than by concern to maintain an internationally acceptable cover for the US military position in the South. It is the US that has scuppered every previous attempt to engage in a peace process. For example, in June 1994, former president Carter, during a visit to the North, persuaded the ageing Kim Il-sung to agree points for a treaty with the US, under which the US agreed to lift some sanctions, help the North build light water reactors and supply it with domestic fuel oil in return for ending its nuclear arms programme. But the US never implemented it, with the Clinton administration believing the desperately weakened post-Cold War situation of the state would mean it collapsed before the US had to make good on its side of the deal. The North, however, did suspend its weapons programme. Alongside these developments in the US, the impact of the end of the Cold War on South Korea was a greater sense of security due to the absence of the threat from an alliance between the USSR and DPRK. In this context the South adopted a new spirit of engagement towards the North, with successive presidents – from right and left – pursuing rapprochement with the North, culminating in the historic summit between President Kim Dae-jung and Kim Jong-il in Pyongyang 2000. Unsurprisingly, parallels have been drawn between that summit in 2000, and the April meeting between Moon Jae-in and Kim Jong-un, with right-wing commentators arguing that nothing came of that summit in terms of denuclearisation and therefore nothing can be expected from this one either. This is to ignore the context and the role of the US in derailing the process. Despite the DPRK having closed its nuclear programme and signed up to the Non-Proliferation Treaty, in his 2002 State of the Union address announcing the ‘war on terror’, Bush included North Korea as part of a global ‘axis of evil’. A year later Iraq was invaded, and fearing it was the next target the DPRK withdrew from the NPT and relaunched its nuclear weapons programme. It was the US offensive against the DPRK that scuppered the peace process unfolding from the 2000 North-South summit, not the obstructionism of the North. The return to a nuclear programme in the North was however viewed with alarm in South Korea, as it was also in China, which was on the brink of becoming the South’s main export market (which it did in 2003). The two countries came together to try to persuade Washington back into negotiations. Together they initiated the framework for ‘six-party talks’ involving the US, China, Russia, Japan and both Koreas, with the aim of getting the US to the table with the DPRK. The US agreed to participate and several rounds of talks were held between 2003 and 2007. But Bush constantly intervened to scupper any agreement. In 2006 the US blew up the talks by refusing to release North Korean foreign assets, and when they resumed they were blocked again by the US claiming the DPRK had failed to fully disclose nuclear facilities. Kim Dae-jung’s successor, Roh Moo-hyun, had been elected in 2002 on a pledge to continue to seek openings to the North despite Bush’s positions on the ‘war on terror’. His government increasingly worked with China to keep the talks going despite US sabotage them, and a summit between Roh Moo-hyun and Kim Jong-il in Pyongyang in 2007 proposed to continue this dialogue towards a peace settlement. But any progress from this meeting was ended by the election of the right-wing Grand National Party’s presidential candidate Lee Myung-bak in 2008 pledged to take a hard line on the North and reprioritise relations with the US. Relations with the North deteriorated rapidly, only beginning to stabilise after the election of Park Geun-hye in 2013. But she took no initiatives towards the North, and agreed to an increase in the US military presence in the South. An increasingly isolated North decided to accelerate its development of a nuclear deterrent, with the stepped up missile and nuclear tests leading to the recent sharpening of tensions on the peninsula. The question is now whether the US will once again scupper the positive progress towards a peace deal in Korea? The problem for the US, for all its talk of peace and deals, is that every actual step towards a settlement in Korea undermines the case for its high level military presence in the South and the aggressive military exercises it stages in northeast Asia each year. Although Kim has been careful not to say it – as it would give the US an excuse to walk away – any scrapping of the North’s existing nuclear weapons would clearly have to be tied to a US withdrawal from the peninsula. The US is utterly unwilling to concede an inch on this, as its military presence in South Korea is crucial to maintaining its strategic position vis-à-vis China. Hence why it has always scuppered any progress in talks. The deeper the US is drawn into these new talks, and with growing sentiment in South Korea both for a peace process and against the US military presence, the harder it will be for it to refuse concessions without losing status, and friends in the region. It is not Trump that has pulled off a blinder in Korea, that honour rests, somewhat surprisingly, with Kim Jong-un. Watch this space. It will be interesting. This article was previously published here on the blog, New Cold War. [ii] The US has a small military presence in Thailand of c.100 personnel. [iii] ‘Inquiry into the US costs and allied contributions to support the US military presence overseas’, Report of the Committee on Armed Services, US Senate, 15 April 2013. Get the vote out for Labour!